Senegal is a West African country with a well-developed mobile market. The level of mobile penetration is 98% (about 15.7 million connections). The average rate for this direction is 11 cents per minute of conversation. Due to this, Senegal is a promising route to make money on termination. If you accommodate your VoIP equipment here, your profits can range from $300 from each channel. 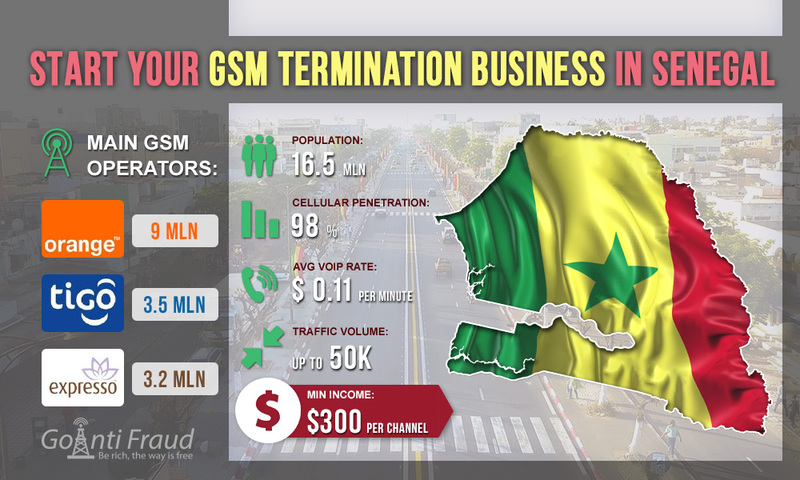 Over the recent years, the economic growth of the Republic of Senegal has been observed, which is having a positive effect on the telecommunications market, in particular, on the increase in the number of GSM operators’ customers. The dominant player in the local mobile market is Orange; its competitors are Tigo and Expresso. Orange owns more than half of all users in the country, Tigo - 24%, Expresso - 22%. Moreover, in 2017, three MVNO's who use the networks of the main GSM operators - You Mobile, Sirius and Origines, had received licenses in Senegal. Now the mobile sector is booming. This is due to not only the improvement of the economic situation in the country, but also to the poor fixed-line infrastructure in rural areas. However, the GSM coverage quality is not very good, especially in rural areas. SIM cards of local operators are sold in retail stores and right in the streets. When buying a start plan at an operator’s outlet, be prepared to present an identity document to register the card. Also, you will have to make a fingerprint. But if you buy SIM-cards from the street vendors, you do not need to present and register anything. The cost of one start plan is about $1.7. The local call rates are quite high - about 10-18 cents per minute, but there are more lucrative offers that allow you to make calls at prices as low as $0.008 per minute. If you locate voip call systems and equipment in Senegal, you will get an income of $300 and more from each gateway port.